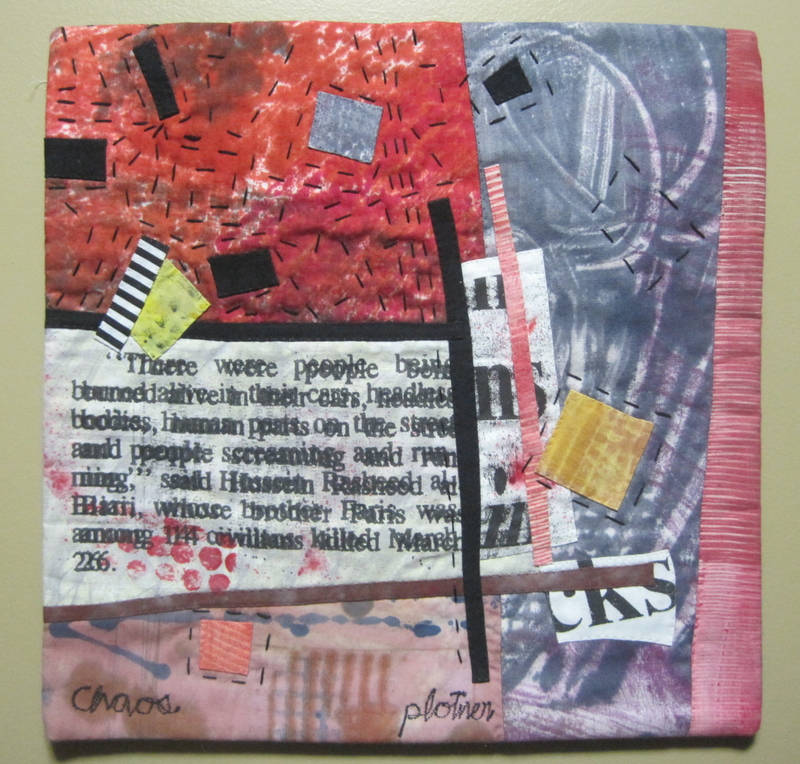 As promised, here is the rest of my SAQA Benefit Auction Quilts. Pamela is another quilter I feel as if I discovered. When I purchased this quilt, she did not have a website and now she is doing amazing work. 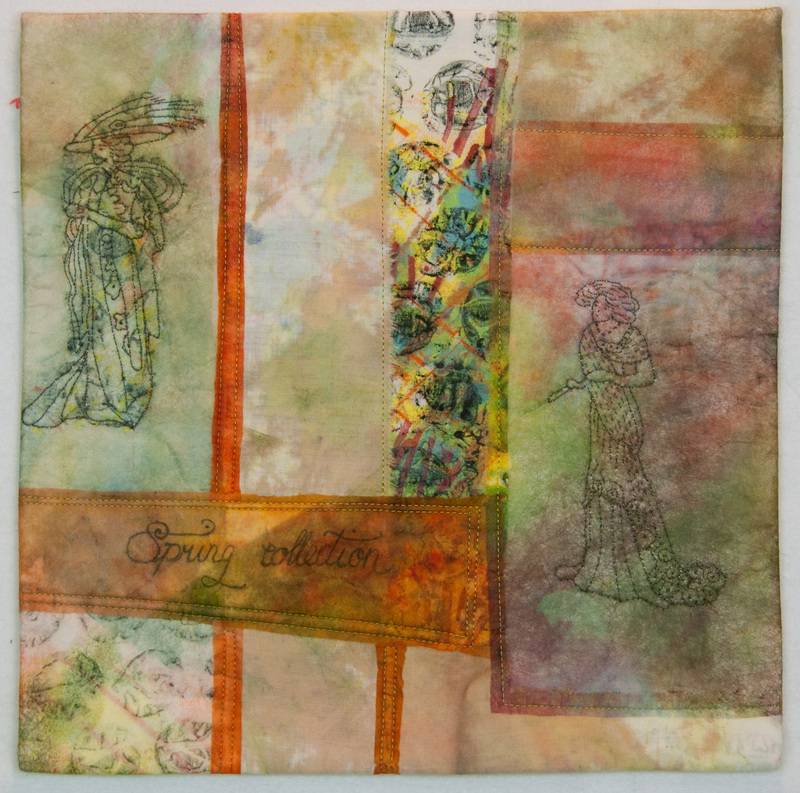 Many of her pieces feature women drawn in the fashion of this quilt. 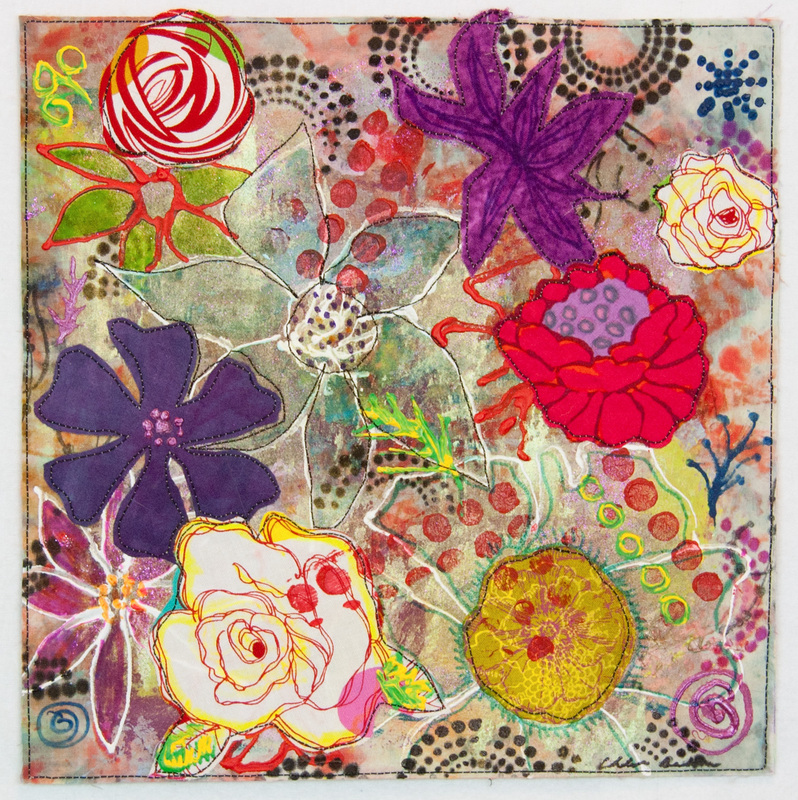 This is a lovely abstract piece with beautiful quilting. I very fond of this piece. The hand embroidery is delicate and lovely. Rhoda is the only quilter in my collection who doesn’t have a website so I don’t know much about her work, but I would like to learn more. 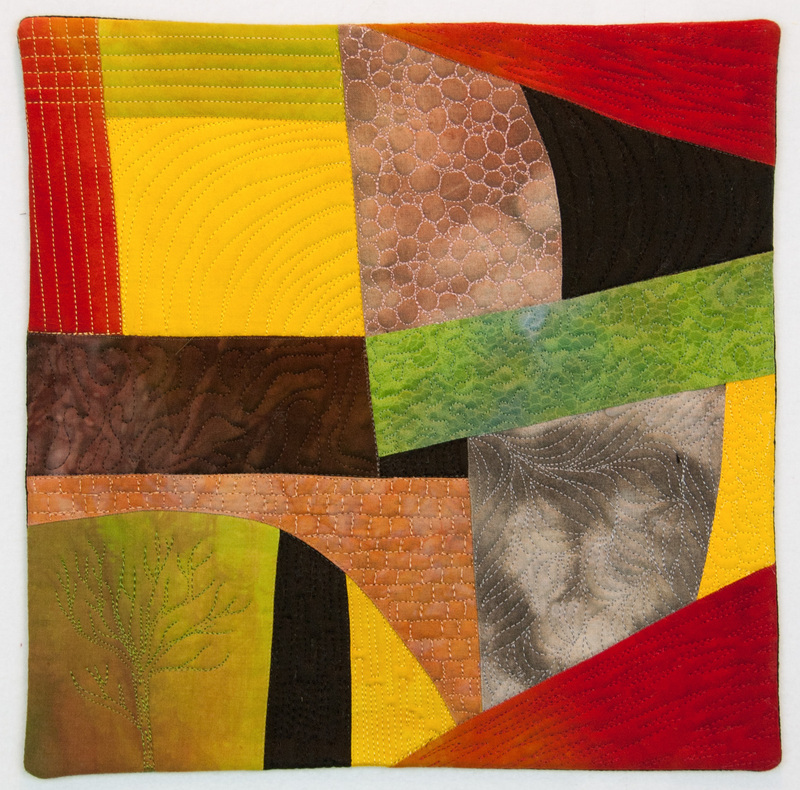 Lisa teaches a class called Lazy Landscape quilts and this is an example of that technique. the background is fused applique and then she stitches the flowers with thread. This piece makes me very happy. I love this quilt! The layering of flowers and the use of color are really interesting to me. Judith employes a varity of techniques many of which are traditionally used in collage and painting. 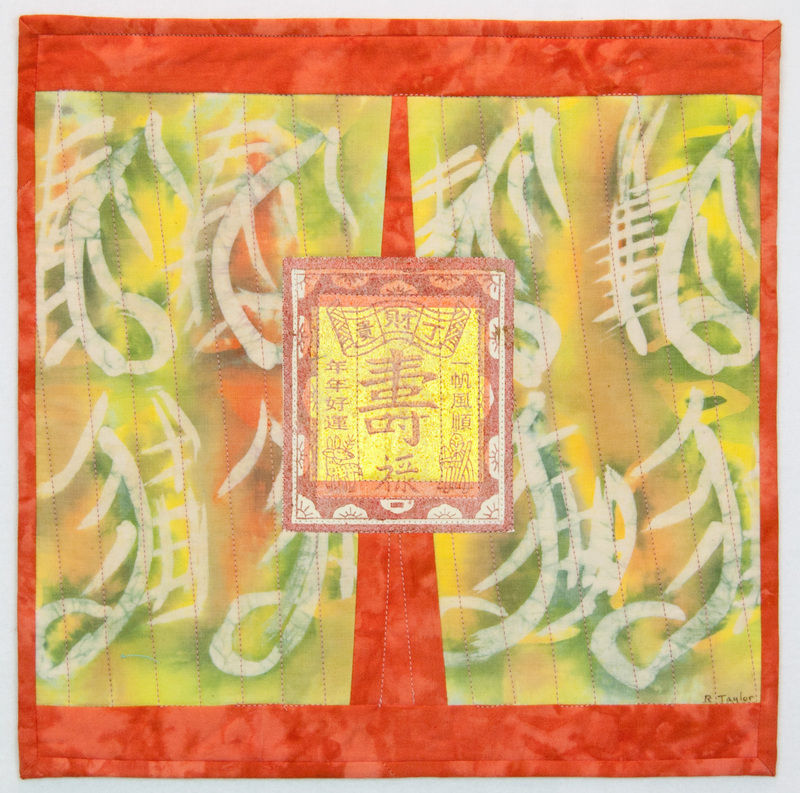 Her work frequently features text and urban motifs. 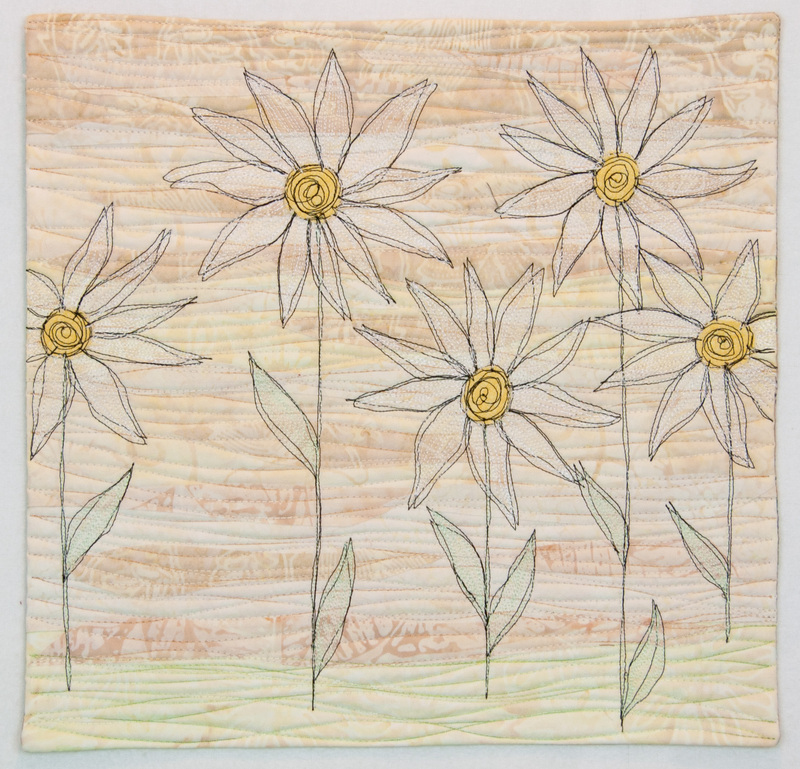 What I like best about Denise’s work is the beautiful layering of curves and stitch. 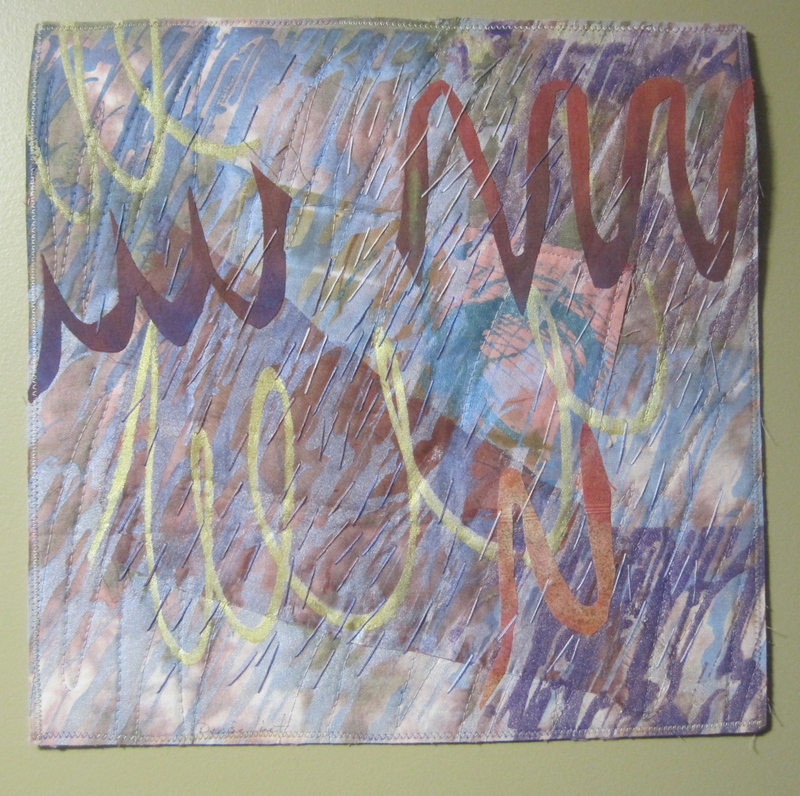 Mary’s work is informed by having spent many years working with adults with memory impairments. The hand work and the justapositions of images is beautiful. I like all my pieces to be together and the only wall that is really large enough to do that is in our bedroom. Every morning I wake up to a wall of inspiration! I know the pieces are not evenly hung–as my husband put it, he is not a curator. We are going to re-space the pieces when we add the new ones from this year. I hope this tour of my collection has inspired you to take a look at the quilts offered in this year’s auction. 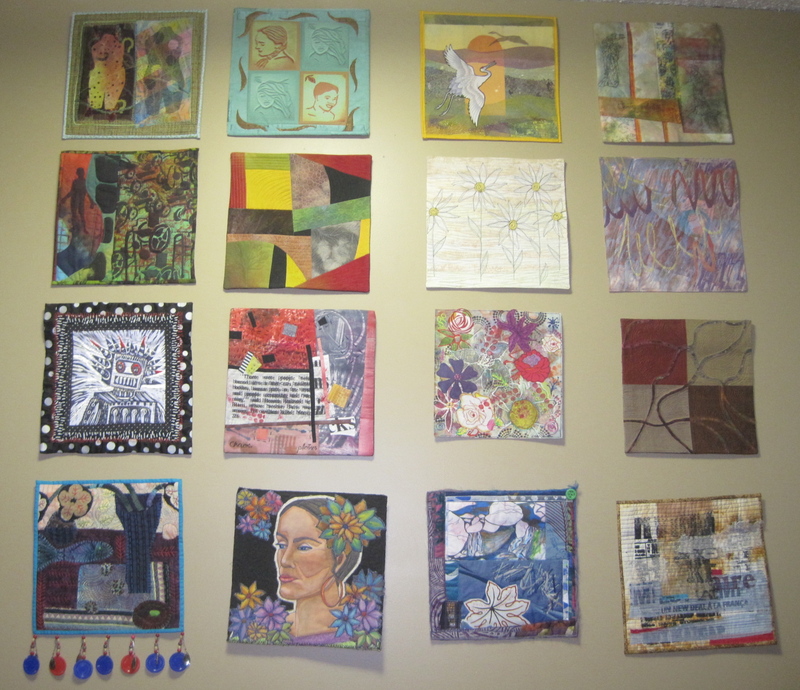 It’s a fun way to learn more about SAQA artists and the art they make. If you missed the first half of the collection, you can see them here. 01 Sep	This entry was published on September 1, 2013 at 8:53 AM. It’s filed under Art in Place and tagged SAQA. Bookmark the permalink. Follow any comments here with the RSS feed for this post. Maria, thank you for sharing your wonderful collection with us. I have been so impressed with your designs, as well, having seen them on the Off the Wall Friday posts. Karol- Thank you for stopping by. I am glad to know you like my work and my collection. 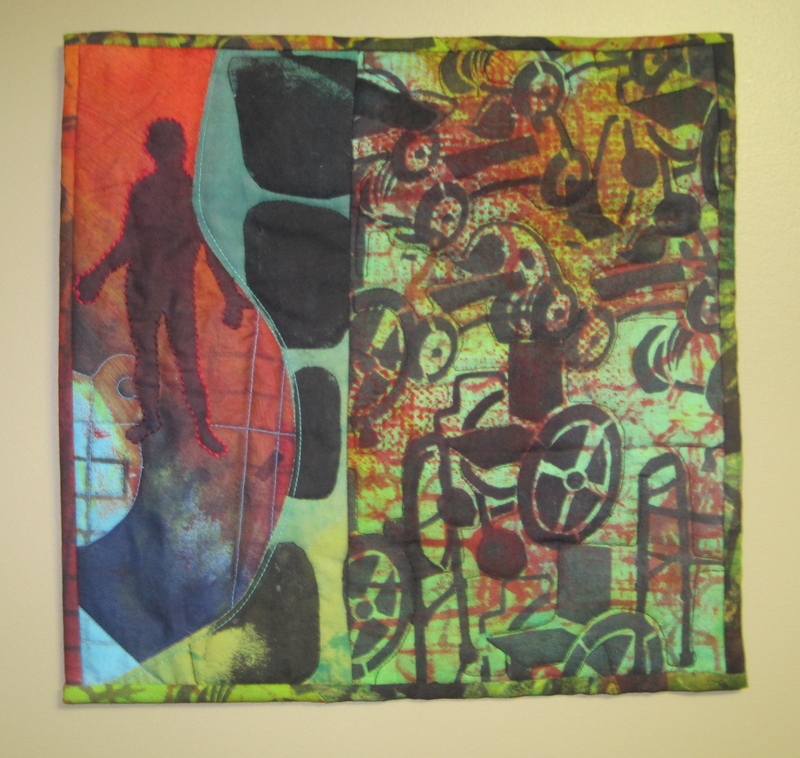 I saw your links on the quilt art group and followed it here. Thanks for the link to such an outstanding collection. You have a terrific variety of pieces. Thank you Linda. I am glad you enjoyed them. Your blog is so great that I am sending it to an East Indian friend who is in Mumbai so your blog is indeed international not only in China now. Your trip to China was an opportunity of a lifetime. Congratulations. I know they loved meeting you. I have enjoyed seeing your 12″ collection and how you have displayed it in your bedroom. I thought about you today when I visited my favorite local weekend flea market here in SC where I bought the most charming vintage landscape of a rustic salmon drying facility framed in a hand crafted pine bark frame. I paid 25 cents for it and am enchanted–proof anymore that you can find anything anywhere these days.